Home >SALMON TACKLE > Soft Bead Kit for Salmon, Steelhead and Trout! From the fish' perspective, the end result is a soft bead that looks like food, smells like food, feels soft like food and tastes like food. Can you say "Fish On!?" I absolutely love these soft eggs i've tried them all and the steelhead not only take them but they seem to hold onto them compared to hard beads. The colors are great I really love the mottled color's for clear low water. I've given some to my fly fishing fanatics and they love the neutral buoyancy and how they can get a prefect swing with them they also said they can cast them much easier then the hard beads. I've used X-factor products for a couple years and have really enjoyed the facts that they are quality products If you haven't tried the miracle worm especially the scrimp pink on steelhead your missing out, I and most of the guys I've given these too use nothing but this worm anymore the steelhead even when they have lock jaw cant leave it alone. The people at x-factor are the nicest most professional group I've dealt with in a long time and I've been steel heading for over 50 years. compare the prices and you will find you get more bang for your buck with X-factor then all the other companies that are getting into soft baits. The complete soft egg kits they sell are well thought out and I love the way they made the egg pin applicator its so much easier to get the stops when you have cold wet old fingers that have problems picking up small objects. You cant go wrong buying their products and if you're not using them you're missing the best opportunity to come along in a very long time. Good color, great value. Bought 3 colors and was not disappointed. I've fished multiple soft beads, but the XFactor Tackle soft beads are my favorite! They are durable, made in the USA, and available in great colors/sizes/scents. The rigging method is nice, with the rubber stops and sequins, included with purchase. If you like fishing beads, you can't go wrong with the XFactor Tackle soft beads! Purchased 5 colors Hot Red, Steelhead Orange, Shrimp Pink, Bubblegum and Hot Pink. About 95% of the time I fish for Salmon and Steelhead are at the Cowlitz River in Washington State. I had so much success with jigs, cookies and yarn but I had to work for it. When I received my soft beads from X-Factor, I went and tried them out that weekend, the first color I used was Hot Red 12mm under a bobber with a 7ft, 15lb leader, it took me 1 hour at the Cowlitz and I caught two steelheads, a 10lb and a 12lb. It was so effective and easy to use, the package comes complete with bobber stopper and everything you need for your set up. The price was very good and I received mine on time and X-Factor did an outstanding job packing them up. That is all I'm using now are my X-Factor soft beads and I'm using them again this coming Easter Weekend. I am going to try other colors and see if they do the same thing as the Hot Red. Very satisfied with the X-Factor soft beads and I recommend them to all other anglers out there to try them out. First time out I used this with a egg sack & I was in the lower river it was easy to rig and the system is so nice cause of the how to videos got two nice steelheads and a monster lakeryou should tryif you have not used before. Great product very nice. Work great. Easy to work with. Will purchase again. Great beads, super price and USA made! XFactor Got it right with this kit. I got this 14mm yellow bead for high/dirty water. First time I had those conditions, I rigged it up and caught a nice steelhead in less than five minutes. Good quality and durability! Really great product. I’m hoping to nail the steelhead on the Situk river in Alaska in May. I bought the soft beads for steelhead fishing. First time out hooked into 2 steelheads. The soft beads are easy to use and are very durable. I'm very pleased with this product and at it's low price highly recommend them. They are now my go to lure for steelheading. Excellent quality soft beads easy to rig up and well scented. I recommend these beads to all my felllow fishermen. I used a single egg below a corky on a treble hook and the fish just slammed the soft bead. They work so well I ordered a bulk package. These work for what I wanted them for. I had the opportunity to use your product for the first time this year and even though I did not catch any fish with it I liked the way it performed. I plan to use it again when I get out fishing for salmon again. Q: Do you sell variety packs? We are currently not offering variety packs but we may consider that in the future. What we will do is toss a free sample or two in with an order if there are a couple colors you just want to see before purchasing, just include a note before you checkout. Let us know if you have any other questions. Q: Recommended bead size for #4, #2 hooks? 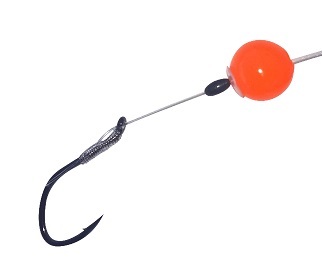 I use 10mm with a #4 hook, 12mm work fine with a #2 hook. These however are general recommendations that could change based on where and how your fishing as well as what your looking to achieve; ie best flotation, neutral buoyancy, etc. Feel free to post a follow-up question here if you need more info. Q: Where or how can I get more of the white ,clear , washer that goes between the bobber stop and the soft beads. I lost mine ? They're called sequins, you should be able to find them at a local craft store like Joann's or Michael's. Let us know if you have trouble locating them, we do have them in bulk and we're happy to figure out a fair price to help you out, if needed. Q: Why is atomic yellow not on the drop down list? A: Thanks for the heads up David, it's fixed! The 14mm soft beads come with 24 per pack. We're not making mottled at this time but we will be in the future. Let us know if you have any other questions. Q: How long will it take my order to ship? If I order tomorrow will they be here by the weekend? That depends, where is here? What state? Q: How many of the 14mm beads come in one pac? The 14mm Soft Beads come with 24/pk. A: Hi Rob! 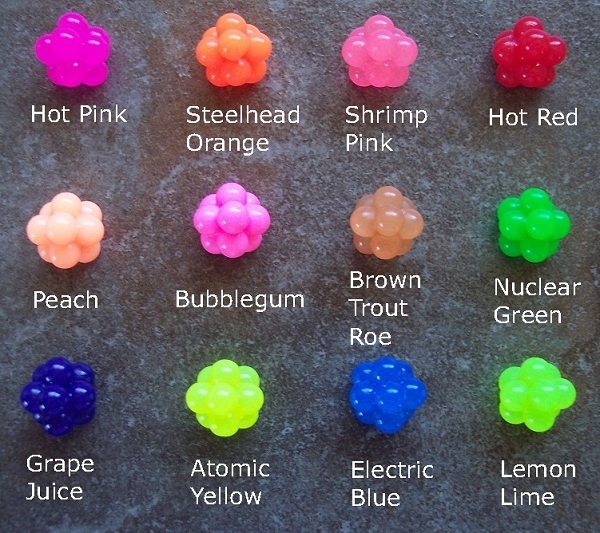 This link is for soft beads, the egg clusters are there for color reference only. Size and color depends more on where your fishing than what you're fishing for. Both summer and winter steelhead have been caught on all sizes of soft beads and egg clusters. As a general rule we recommend: low and clear = small and light (orange, peach, shrimp pink, etc.) , high flow / lower visibility = bigger and brighter (12 or 14mm in hot pink is best here). I'm always hesitant to make a rule here because there are many factors that contribute to choosing size and color. When in doubt, just call us at 541-508-3474 , we're happy to research the river you're fishing and give our recommendation based on water flow, water temp, time of year and in many cases personnel experience. Thanks for the question, hopefully this is helpful to you. Q: Can i get just sgl eggs ..? Q: how do we find the anise scent soft beads you showed in your demonstration?